Parenthood throws this father his first big curve ball. When my wife told me she was pregnant with our first child, I slumped forward in my La-Z-Boy and wept sloppily into the popcorn bowl. In that moment, I knew that my life would be blessed with children ... and more baseball. Actually, I did more than look forward to it. I obsessed. Before my wife was even showing, I was prowling the aisles in Sportmart for baseball equipment. I wanted our unborn superstar to have the very best gear, including a glove that would serve him or her as well as my dear old $14 Wilson had served me. That reliable line-drive vacuum put in 17 years of service before a colleague of mine attacked an ump with it at a company softball game. In the bench-clearing brawl that followed, my dear Wilson was ripped in half. So when it came to selecting a glove, I sagely opted for durability — the black leather Derek Jeter signature model. It bespoke confidence and, yes, machismo. A little machismo would make up for the wimpy, extra-squishy Safe-T-Ball that we’d be using for throwing practice. I put the gear on the top shelf of my closet and waited. Four years later, I decided it was time. The air was crisp. A spring sun had turned the yard that magical ball-field green. Our son Henry’s athletic life would begin today! I went to the closet and pulled down the equipment. The leather still smelled new. 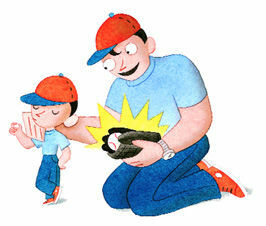 Shaking with anticipation, I showed Henry his new mitt. “Wanna have a catch?” I asked, choking back a sob. He looked at the glove, then at the Duplo structure he was building, then at me. “’kay,” he said with a shrug. On that sunny spring afternoon, I realized that expectation is the not-so-squishy ball that gets tossed between fathers and sons. I’d never be able to design my children to meet my expectations; all I could do is guide them. Whether I liked leotards or not, Henry was going to be his own man. And I have an unused, black leather Derek Jeter signature glove sitting on my shelf to prove it.